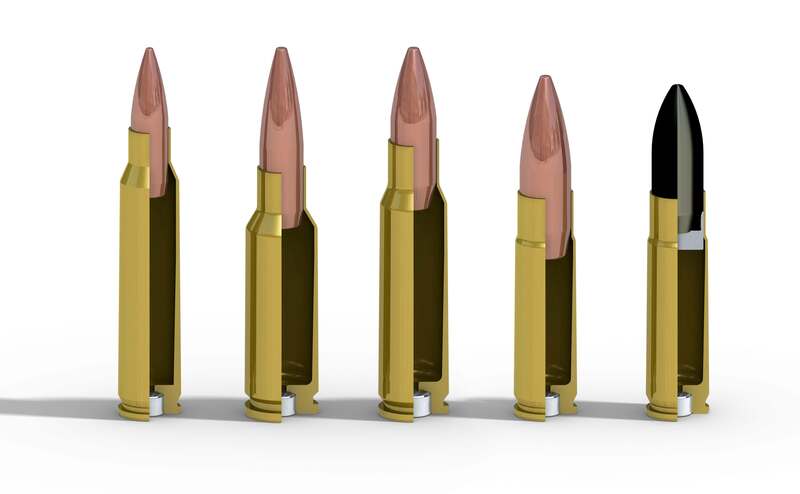 There are several cartridges that could benefit from CBJ Tech AB’s subcaliber technology. 5.56x45 Nato is a very good cartridge in many aspects. It has low weight, low recoil and a flat trajectory, but it has issues with inconsistant lethality, especially when shot from shorter barrels. 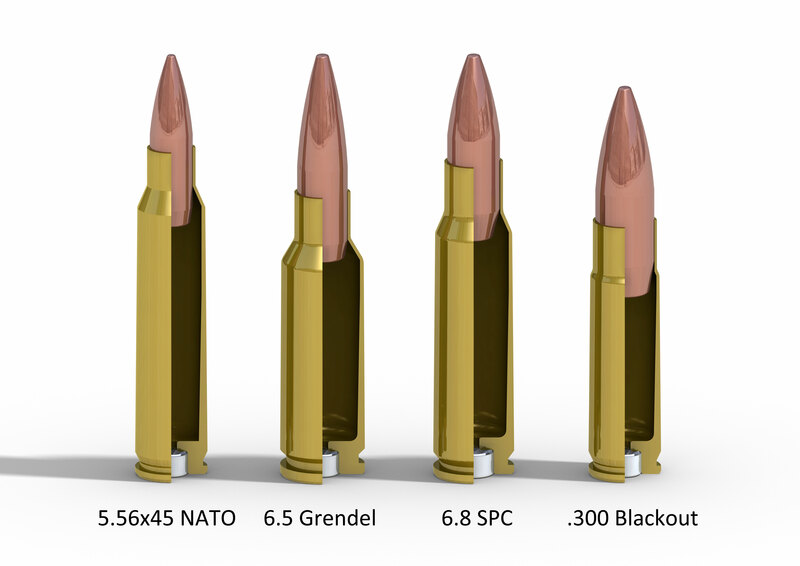 A common question we get is if it is possible to apply the subcaliber technology to the 5.56x45 Nato, in order to increase the lethality and armor piercing capability. 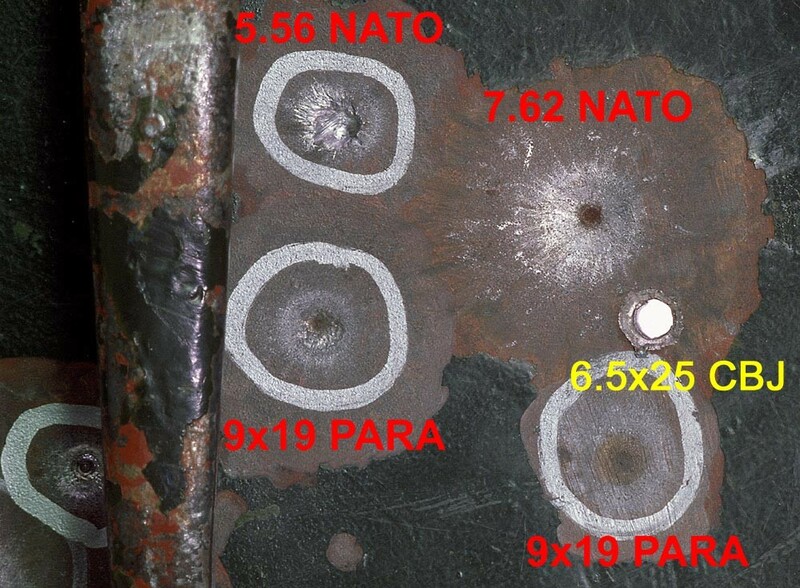 The problem with applying this technology to the 5.56x45 Nato is that the diameter of the projectile is very small to begin with. 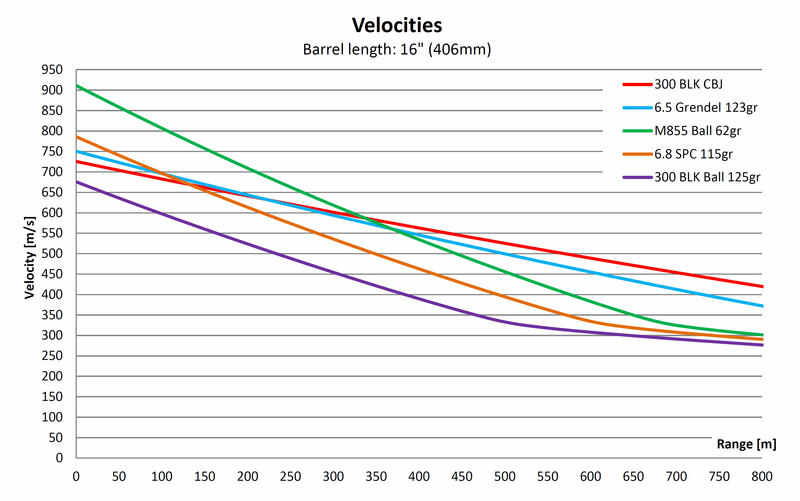 In order to have any increase in performance with the subcaliber technology, there has to be a difference between the core projectile and the bore. There are also limitations on how thin the sabot can be made and still hold together without sending fragments in all directions from the muzzle. The core projectile would be very small and light, and therefore be less effective than the full caliber projectiles, making the whole exercise pointless. The AR15 weapon platform is very popular and widely used, but it was designed for the 5.56x45 Nato cartridge, which sometimes limits the potential of the system. In order to increase the lethality and have a better and more consistant performance, several new cartridges have been developed. Some works better than others. The picture shows some of the most common of these cartridges. 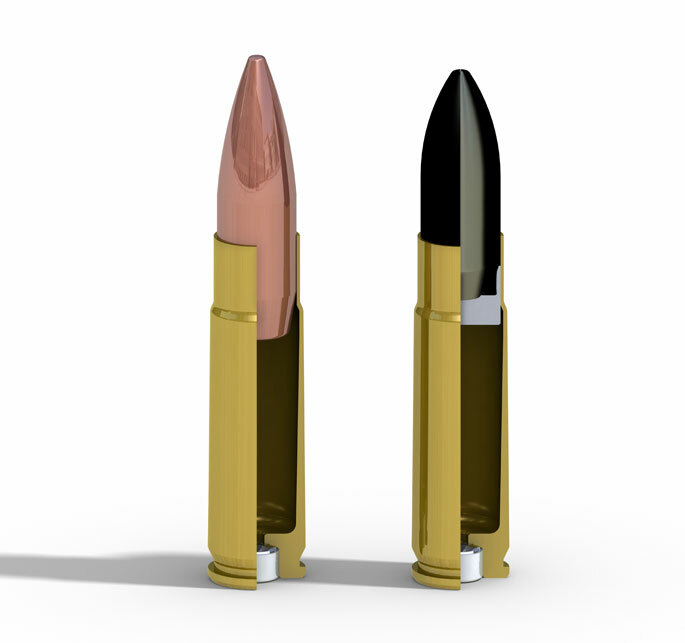 Both the 6.5 Grendel and the 6.8 SPC use cartridge cases that are wider than the 5.56x45 Nato. This gives more room for propellant and increases the performance, but it reduces the magazine capacity when using original magazines and it causes feeding and ejection malfunctions from time to time. The 300 Blackout has the same outer diameter as the 5.56x45 Nato, and it does not have the same problems that the other two cartridges have. 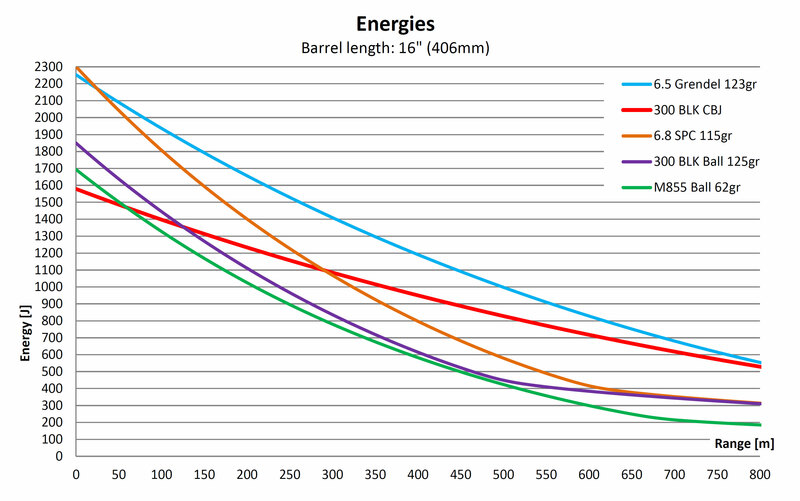 It has a wide range of available projectiles from supersonic 78 gr to subsonic 220 gr. This makes the cartridge very versatile, but it still lacks an alternative that has a very flat trajectory, like the 5.56x45 Nato has. Until now. Most of the testing has been done with an unmodified AR 15 in 300 Blackout. It has a 16″ barrel with a 1/7″ twist. The operation principle of the test weapon is direct gas impingement, and it does not have an adjustable gas block. The weapon cycles flawlessly with the 300 Blackout CBJ and the recoil is identical to factory loaded 300 Blackout with 110gr (7.1g) FMJ projectiles, which is soft and manageable. The charts below has been calculated with published data for the different cartridges. 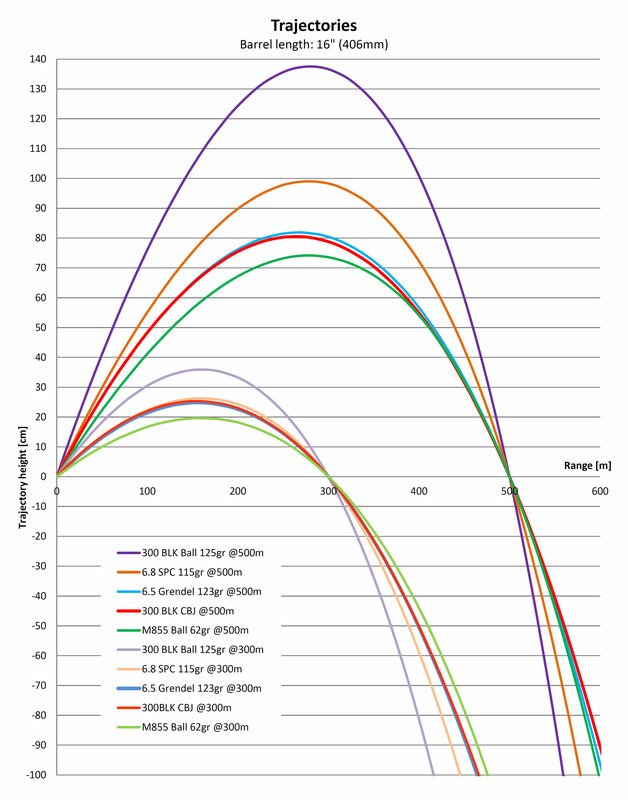 The data for the 300 Blackout CBJ have been measured, and the BC (G7) has been calculated by using existing formulas that calculates BC with regards to the projectiles characteristics, like caliber, nose length, nose radius, nose shape, boat tail, density and overall length. The penetrating performance has been tested against several types of armor and other types of barriers. The picture shows an armor plate with a thickness of 12.7mm and a hardness of 300 HB. 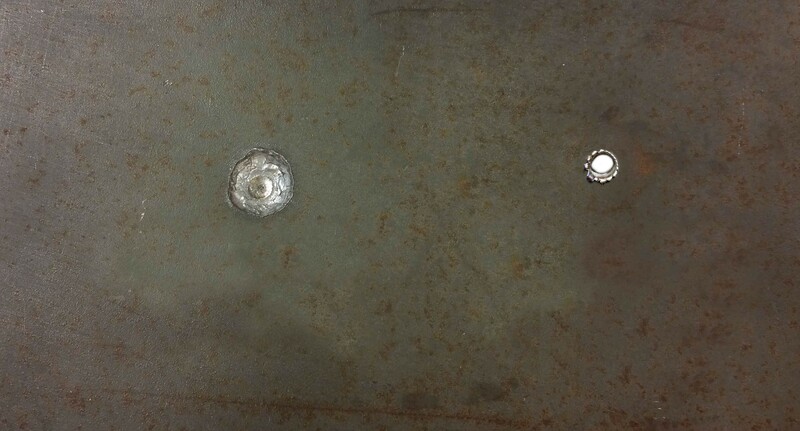 This plate was shot with the 300 Blackout CBJ at 10m range giving the core projectile a hitting velocity of 720m/s. The hit to the right shows the full penetration of the projectile. The left hit is from a 300 Blackout FMJ 125gr at the same range with a hitting velocity of 670m/s, showing no penetration. 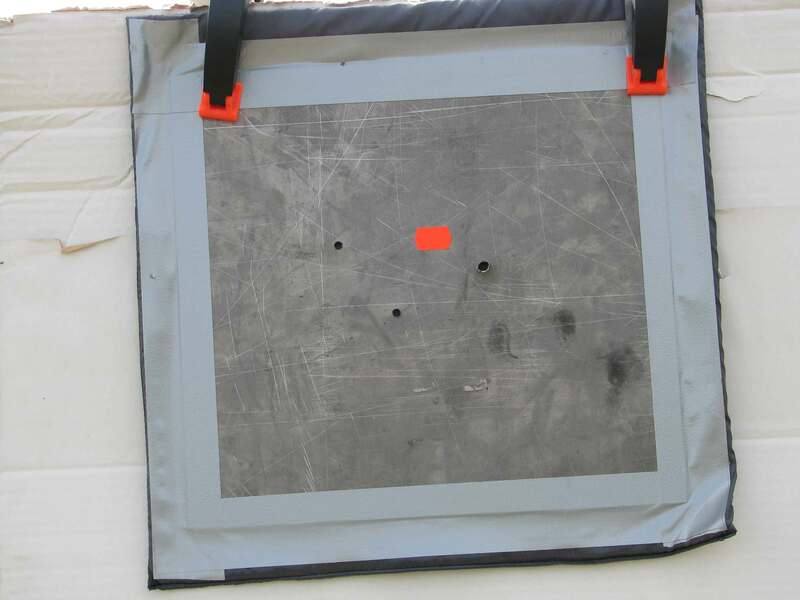 Several tests have also been done against thinner armor plates like the one in the picture, which has been used in previous testing with the 6.5x25 CBJ Ball. This armor plate is 7mm thick and has a hardness of 450 HB. The .300 Blackout CBJ is able to penetrate this plate at 500m range, with a hitting velocity of 526 m/s. The 300 Blackout CBJ has also been tested against NATO CRISAT Panels (NIJ Level 3a) consisting of a 1.6mm grade 5 titanium plate in front of 24 layers of Kevlar. This panel stops all 9mm FMJ projectiles, even at point blank range. The 300 Blackout CBJ has velocity and energy enough to penetrate this panel at a range beyond 1200m, which in practical terms means that it will be penetrated at any range where it can be hit. Several tests have been done against blocks of ballistic gelatin. The picture below shows a typical cavity from a .300 Blackout CBJ projectile.